In 2017, Mrs Hughes and Mr Carson might be slightly surprised to discover that their staff rooms and cellars running under the Castle have been commandeered. The staff dining room with long table and benches, an upright piano and fireplace, the beer cellars, storage rooms, cupboards, flower rooms and the very extensive white and red wine cellars, of which every superior butler from Jeeves to Mr Carson would have been rightly proud, look somewhat different. Visitors instead find they are entering the world of ancient Egypt and the story of the discovery of the tomb of boy king Tutankhamun. The 5th Earl of Carnarvon and Howard Carter spent some 16 years in Egypt before becoming the centre of the first global world media event in November 1922: a Pharaoh’s tomb had been discovered almost intact and we could all glimpse the treasures, the “wonderful things” and culture of this ancient civilization. The second room of our exhibition develops the theme of life at Highclere before the First World War and in one of the cabinets you can see the 5th Earl’s camera. He had taken up photography after his car accidents which had so compromised his health that he not merely spent the winters in Egypt but also looked for other interests which he could pursue as a partial invalid. On various information boards I have tried to explain how the photographs were created and developed. It all now seems so distant in the era of cell phones and selfies! In the archive rooms we still have some extraordinary photographs from this time: of Egypt from 1909, of Lord Carnarvon’s travels through Europe and of studio photographs. He built a photographic studio and dark room at the back of Highclere Castle as well as a dark room at “Castle Carter”, the house Lord Carnarvon built for Howard Carter in the Valley of the Kings, Luxor, Egypt. The albums are so interesting but not all the names or places are written alongside the photographs. Today, however, most of us probably do not even print out our photographs. Highclere’s photographic archives extend further back in time. The 4th Countess clearly enjoyed collecting photographs of her friends and of eminent personages. I try to share them in my books but again do not always know who is in them. Just last week, looking again through the books, David our archivist rang me in a state of excitement because he had recognised a photo of George Étienne Cartier one of the founding fathers of Canada. Cartier stayed here several times and we have subsequently realised it was he who had penned a few charming lines in the visitor book as he returned to London and then back to Canada in 1865. I hope all these remarkable guests enjoyed staying here and I am grateful that my predecessors were sufficiently interested in the new art and science of photography to leave some photographic glimpses into the world a hundred and fifty years ago. My husband and son Edward are keen photographers too and I have enjoyed using their work in books and here on my blog as well. Those thoughts led me further to think about asking others to enjoy photography here. Autumn is so beautiful so I thought we would have day of autumn trails, trees and teas on Sunday October 15th We could ask any visitors if they would like to take photos on the day and have a little competition. If it rains there is still plenty to explore in the Egyptian Exhibition. Perhaps the prize should be a tree although that might give a challenge to our overseas visitors so I will have to think of an alternative! Bitte verzeihen Sie meine Fehler – es ist leider so viele Jahre, seit ich Deutsch gesprochen habe!!! I am certain Mr.Carson and Mrs.Hughes would applaud the changes made to their domain below stairs. You have to do what you have to do to keep these great places running. I love autumn; it is my favorite season and I often have my camera on my daily walks. I love playing with angles and shade and have obtained some interesting shots that my family cannot recognize, even though they are things they see every day. Such fun! Someday I want to come to Highclere, with my camera, of course! Thank you so much for sharing! I have been planting an area of our Wood of Goodwill for Autumn and it is beginning to begin. I was looking yesterday and I need some yellow against the deep red – you are right contrast and shade. GOSTO MUITO DESSE BLOG , ADORO ESPERAR TODA SEGUNDA FEIRA POR ELE ! AMO FOTOGRAFIA E JARDINAGEM . OBRIGADA POR TODAS ESSAS QUERIDAS NOTICIAS. I had not really thought about the location of the Egyptian Exhibition, but it indeed is the location of the servants hall! I was so fascinated with the exhibit when I visited Highclere. The artifacts were beautiful, and the thought that the 5th Earl had found the tomb of King Tut! I think it is too exciting. The only sad part is that Lord Carnarvon did not live to enjoy his discoveries. I think that your plans for an Autumn party and day of photography sound wonderful. I can only imagine the splendid images in the visitors photographs. With such a splendid venue, how can one go wrong? I hope you and your guests have a smashing time. Perhaps your prize for the photography could be a 2018 Calendar of Highclere if it is available. The photos are always so lovely, and it would be such a nice keepsake for anyone who loves your estate. I loved visiting the Egyptian artifacts when I was there Sept 4, and I do consider myself an amateur photographer, so especially fascinated with the photo exhibit. I noticed that there seemed to be a sort of ‘jail’ in the basement and wonder if that is what it was used for? I was disappointed that no photos were allowed to be taken inside Highclere, as I was armed with my ‘pro’ camera hoping to capture my view of the beautiful inside….. I love the connection with Canada….I think a ‘red & white’ day is in order in the future! The “jail” is in fact the door leading to the champagne cellar in which some cases of said delight share their space with Anubis, Hathor and a Guardian Statue. lights do come on in the gloom. It is tricky but we are like many other houses and prefer to keep to photographs outside so I just thought I would make something of it and encourage everyone’s children as well to take photos of the beauty of the trees in October! I thought I might celebrate John A day and revisit the BNA act, and Highclere’s part in it, on July 1st again next year. I utterly agree with you and I might have deciphered more letters by then. Good morning and greetings from St. Clair, Michigan, USA. I have enjoyed reading your blogs about Highclere, as I am fascinated not only by it’s history, but the history of the family. How would I go about buying one of the 2018 calendars mentioned above? I love that there are old photos to give us a glimpse into the past. It’s so fascinating and thrilling. Part of my job is photography, so it’s especially interesting to see the play of light and shadows in these older photos. I imagine Highclere in autumn is spectacular. I so wish to visit sometime. And you’re right about adding yellow to the crimson — it is my favorite color and looks so striking against the deeper shades! Thank you for all your interesting posts. It’s so great to be connected from across the pond. My only disappointment during my 2014 visit to Highclere was not seeing the Egyptian exhibit. King Tut is fascinating. My U.S. radiation oncologist is Egyptian and travels back and forth frequently. He has his office decorated in Egyptian art, including a life size piece of King Tut. I must get back to England someday and see your exhibit. Of course, seeing the rest of the castle will be wonderful, too. Dear Lady Carnarvon, thank you again for a wonderful blog and autumn pictures. We live on the 21st floor of senior housing and can watch the trees and river gorge change seasons. The autumn colors have been coming in for a couple of weeks. Just a collage of beautiful colors. Thank you again. Thank you for sharing more wonderful details about the “abbey” ;). Portraits of us on the grounds are on our walls because she strikes a lovely pose with her huge and magnificent trees. Knowing more about the 5th Earl and his love for photography is so fun to consider! I so love getting a new story from you!!! The “Abbey” always photographs well! Thank you so much for writing about Highclair. I hope at some point I can travel to see the castle from Alabama. 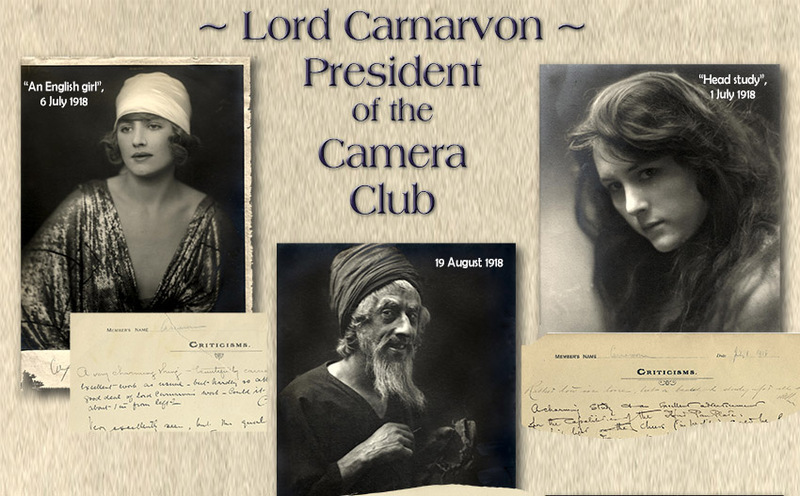 Dear Lady Carnarvon, I was wondering about the authenticity of the man on your picture. Would it be possible, that it is the old Czech actor Jindrich Plachta? Even I am almost certain, you may tell me otherwise!?! Do you know the origin of that picture? Thank you. I can spend hours looking at photos of past eras – I find imagining those bygone days fascinating. I hope to get a chance someday to admire the photos on display by the past residents of Highclere. When I study old pictures, I often wonder at the people that populate them, and what their their lives were like. The photo of the girl with her hair down around her shoulders could have been made yesterday, but instead is almost a century old. Amazing! I remember when the King Tut tour was a huge deal here in the States, back in the 70’s when I was a teenager. It would be fascinating to view the artifacts around the discovery of the tomb. I used to live up in Maine and fall was my favorite season. It was usually pretty short – winter likes to lay her chilly hands on that part of the States early – but it was such a colorful time of the year. Enjoy all the lovely colors of fall in the gardens at Highclere! I’m looking forward to hopefully seeing some of the pictures from next month in your blog. Cheers from Summerville, South Carolina! Take care! I agree with you, old photos are about looking and wondering – a glance at someone and from someone. I will enjoy them – at the end of the week I will spend some time cutting and collecting flowers for the tables – it is I suspect, one of the last times this year of some abundance! I was very interested to read about new discoveries in photography of the Egyptian artefacts. I wrote to you re my cousin, Artist Charles Kyrle Wilkinson who was on an adjoining expedition in 1920. Did you manage to find out anything more about him? . He was with Metropolitan Museum of New York team. I would love to make another visit to Highclere Castle again to find out a bit more. All I have to say (having just read your latest posting) is that you write one of the two or three most interesting (and, much more importantly, obviously sincere) blogs that I know of. You do seem to be a person who’s found her real work/calling in life…..which I hope you take as a compliment. All I can say is thanks; it’s always a pleasure to read your writings. Thank you so much for such interesting reading Lady Carnarvon,it is all truly fascinating,especially anything about Tutankhamun as I have travelled extensively in Egypt…..mostly around Luxor,so I have seen the most wonderful temples all the way down to Aswan…and of course Abu Simbel. The Valley of the Kings and Queens has to be one of the most awe inspiring experiences on earth,and I have visited the boy King’s tomb many many times.as I have the Carter house also.I was lucky enough to go when they showed a hologram of Carter and it was riveting stuff,with him walking around his desk,and seeming he was actually in the room. Above the Carter house there is an even more imposing building which I was led to believe was the house of Lord Carnarvon,but that has been disproved several times,so maybe you can shed more light on that? Until recently my partner and I would visit Egypt 4 times each year,but since my partners health has declined it is no longer possible,but I know I will return. 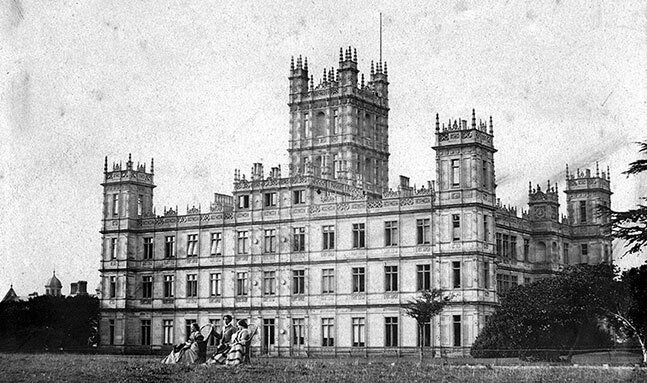 I have yet to visit Highclere ,but I certainly will. You are very kind – I read incessantly as a child and teenager and I was also so lucky in the encouragement of my school: to try! I so want to come and visit someday – maybe Autumn would be a great time – keep up the great telling of history! Your mention of the Egyptian antiquities at Highclere brought back some memories of my youth. In 1963 I was fifteen years old, my parents and I lived in St. Louis, Missouri. One Sunday my father was reading the newspaper when suddenly he stood up and told my mother and me that we were going out because “there’s something interesting at the Art Museum”. 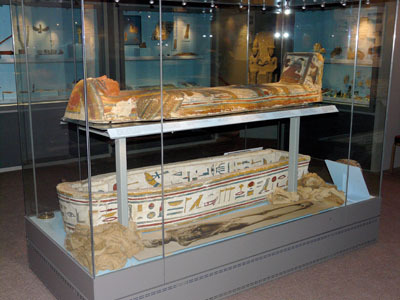 So off we went to see “Tutankhamun Treasures”, an exhibit on tour, loaned by the Dept. of Antiquities of the U.A.R. I still have the booklet/program from the exhibit. It was so fascinating that it inspired my lifelong amateur interest in archaeology. I look forward to one day seeing the Egyptian antiquities at Highclere! Somehow I think Carson and Mrs. Hughes would approve of the Egypt exhibit, as they were loyal friends of the family as well as employees! I’d love to visit, see this exhibit and photograph Highclere’s flowers one day. As an amateur photographer and genealogist, I especially enjoyed seeing your vintage photographs and reading the stories behind them today. A good photograph reveals its subject, but a great photograph tells a story. What intriguing stories! Recently, I helped a family recover waterlogged World War II photographs of General Douglas MacArthur decorating officers in Australia. 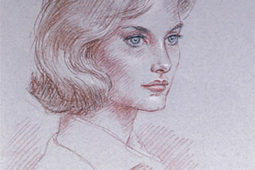 Your beautiful portraits reminded me of that poignant experience. Thank you for sharing these treasures and preserving them for future generations. Perhaps you could include the winning guest photograph in a Highclere photography book? You are quite right – it is a fun idea to include a photo – it is just a question of the hours in a day!!! Your idea about the 2019 Calendar is brilliant! I love this idea and can’t think of anything that would be as lovely as this. I think visitors at Highclere would love to see their photography showcased in your beautiful calendar. I sincerely hope you implement this plan for the winning photo. 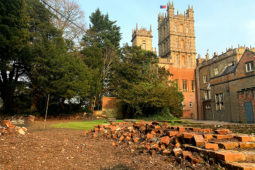 The addition would be a GREAT entry into the 2019 Highclere Castle calendar. Bravo, Lady Carnarvon!! Once again, Lady Carnarvon, you have chosen a fascinating topic. King Tut and the events surrounding his discovery have always held a kind of magic for me. However it was the picture of the staff dining table that got my imagination going – thinking that once upon a time my mother would have sat there. Talking of photos I should now check my mother’s collection as she too took pictures frequently and there may be one or two of interest to you. Barbara Dale is the niece I bought tickets to visit you on the 4th September. She and her sister came to me in Somerset ecstatic about their day at Highclere. You obviously do a brilliant job of welcoming your visitors. Thank you. Patricia – I would love to see any photos you have – how amazing! Is this answer addressed to me Shirley Gould-Smith? I am not sure what is meant by photos or what is amaxing?? particularly as My message does not seem to have been cleared yet. I look forward to your Blog each time. I’m also a history buff, and love the history of Highclere Castle although I’ve only been able to visit once since I live in Montana. While enjoying the old photograph of the castle, I noticed to the left of the photo a dome peeking over the grove of trees. Is that building still there? I visited in May of 2015 and didn’t see anything like that. Also, in August of this year, you shared some amazing photos of the rebuilding of a huge medieval barn on the estate. I would love to have you revisit that project in your Blog with some before and after photos. I love the ancient oak almost as much as the old cedars. We, too, are getting ready for Winter and enjoying our beautiful Fall colors. Margaret the dome is still there and has been there for perhaps 400 years !!!! It is part of the back part of the Castle – the older part I suppose. I am going to return to a barn video to show where we have got to, I am just trying to sort out some dates! Your item is being held in Customs at 8:09 am on September 26, 2017 in COVENTRY PARCELFORCE, UNITED KINGDOM. I have no clue as to what this means. i would buy the 2018 Calender and I hope it has some Yummy recipes to try. I did try one of them that was posted earlier. Mine came out OK but I think yours was better. Maybe I can take a Cooking class there. I am vegetarian. Hello Rita, it means that your parcel is currently with the customs authorities and is being assessed for import duties and local taxes. We are looking into holding some foodie days next Spring so keep a look out for more information. Thank You for responding. Not sure how long the parcel will be held at customs ( Just 7 Handmade Hearts). Hopefully, you will get them soon. Thank you for the photos and your beautiful blog work, not to mention all the endless hard work that you’ve put into Highclere. It is magnificent. Several years ago in the pre-Downton era I saw an article on your home that showed the top floor in some architectural distress with water damage and other issues. I know you’ve done lots of renovations in more recent years and I’d love to see an entry devoted to whatever preservation you’ve been able to devote to those smaller bedrooms and some of the less well-known areas that were previously in jeopardy. I am so happy to have gotten to know your home through the series and I love seeing your updates and posts, but I’ve worried about that top floor from time to time. By the way, I also very much enjoy your dogs – we have Labradors, too, and couldn’t ask for better companions. How kind you are – the top floor now has some beautiful bedrooms and some other rooms I would to transform back into the children’s nurseries as I think visitors might like that. The outside is ok and I am just working my way round as and when.. I am re convening this blog web site to share more with you all..it keeps growing. I am so fond of my dogs! I can’t wait to see the pictures and read the entry – I hope you have space for before and after photos! I’m so happy that your situation changed so much for the better. Very sorry to bother all of you again. I was wondering if you or JULIA MORGAN can help me. I live in the United States . Is there a way that you or Julia call HMRC. . Or call parcel force themselves. If you have put a value on the parcel of over a certain amount, their will be a charge to pay for them to be released to the recipient. The 7 Handmade Hearts have been Held at Customs for over a week. At Parcel Force. This has been a nightmare. I honestly thought that it was great idea to send the hearts so that you could Honor the Manchester, Portland, London victims as well as Military. Please advise as what I should do. I appreciate your sentiments – I am not sure there are ever numbers to ring in today’s’ world !!!! The gift shop team are back later this week and they may be a better idea as they know more about shipping.. Always a pleasure to read you! Always nice to see pictures! 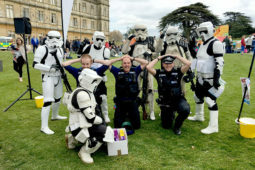 Do you celebrate Halloween at Highclere Castle? Your blog shows such wonderful photos. Speaking for myself, I really do like to have a photo in hand, to handle and label and be able to pass on. I am no “techie” and I dislike the transient nature of photos in a cell phone. Photos are such a legacy to share and pass along to future generations when labeled properly. Highclere Castle and the family today would have much less history if not for those printed photos and other memorabilia. So would the rest of us. Thank you for sharing your photos. Might you ever consider other books with more photos of Highclere and its own history, as well as history of that local area? Thank you! It would be a great idea.